Newsflash: Apparently, Obamacare will Reduce Full-Time Employment. Who Would Have Guessed? The Affordable Care Act will reduce the number of full-time workers by more than two million in coming years, congressional budget analysts said Tuesday in the most detailed analysis of the law’s impact on jobs. This almost certainly underestimates the impact. Why? Well, one reason is that a lot of full-time jobs were switched to part-time jobs way back in late 2012. That is what our company did. Why so early? Because according to rules in place at the time (rules that have since been delayed at least a year) the accounting period for who would be considered full-time for the purpose of ACA penalties would be determined by an accounting period that started January 1, 2013. So, if a business wanted an employee to be considered part-time on January 1, 2014 (the original date employer sanctions were to begin), the changes to that employees hours had to be put in place in late 2012. More on this here in Forbes. In addition, this CBO report is a static analysis of existing business. It does not seem to include any provisions for businesses that have dialed back on investment and expansion in response to the ACA (we have certainly cut back our planned investments, and we can't be the only ones.) This effect is suggested (but certainly not proven) by this chart. 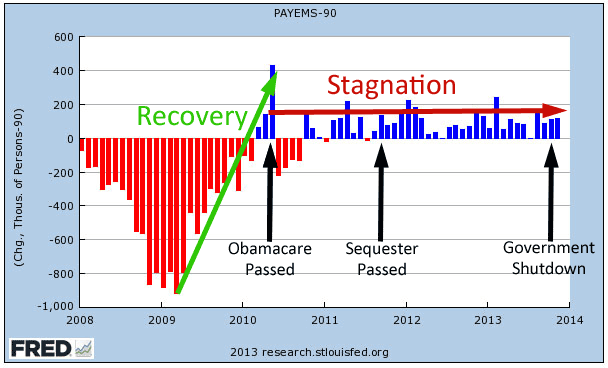 The sequester and government shutdown were cited by the Left as reasons for a sluggish economy. Which government action seems most correlated with a flattening in job growth?